Mid layers keep you warm, and in this category are included fleece tops, additional T shirts (wicking ones, of course) and anything else that’s between the base and outer layer. Some soft shell jackets can act as both mid layer and outer, as they keep the wind off if worn on the outside, but are insulated and thus keep you warm if worn under an outer jacket. People warm up at different rates when walking and some and don't need a mid layer, managing with just a base layer and outer jacket. In such cases, one should always carry a mid layer in case conditions change. 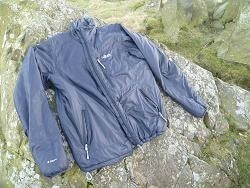 Fleece tops are warm, retain some heat if wet, but can be bulky inside a rucksack. More modern mid layers that use synthetic fillings tend to pack down smaller. Click here for more information on the layering system, together with a couple of videos.